They've had a bit of a long road getting here, with a design that went off the original vision and a brief pause but it really does seem like they're firmly back on track now. Even taking into account that this is very unfinished still, with Nightdive noting how it's "missing enemies, weapons, effects, and sounds." it does look really good. As someone who finds the original far too dated both graphically and mechanically, I'm pretty excited to see such a remake. I'm so glad they're back on track & making progress. I have held off playing System Shock 2 just so I could play this version first, and the question remains: When? When when when? Wheeeeeeeeeeeeen? Very good sound effects! Really solid audio. That's a very good sign in itself. Love the look of this, but it's just a bit too dark for my taste. Hopefully they have a gamma slider (as I'm sure they will). Really captures the "feel" of the original, at least through my hazy, nostalgic goggles. At the "Enter that room and it will become your grave" part, I felt sure that a host of cyborgs was going to waltz in and attack - I remember a similar room in the original that creepily had you walk past about 30 cyborgs in stasis to get to, then of course Shodan revived them all once you were inside <shiver>. Nanobang I have held off playing System Shock 2 just so I could play this version first, and the question remains: When? When when when? Wheeeeeeeeeeeeen? You should just play SS2 now. The story in both games are basically self-contained and playing the 2 in order is entirely unnecessary. SS2 is kinda janky, frustrating and ugly so you kinda need to be in a certain nostalgic mindset to enjoy it nowadays. 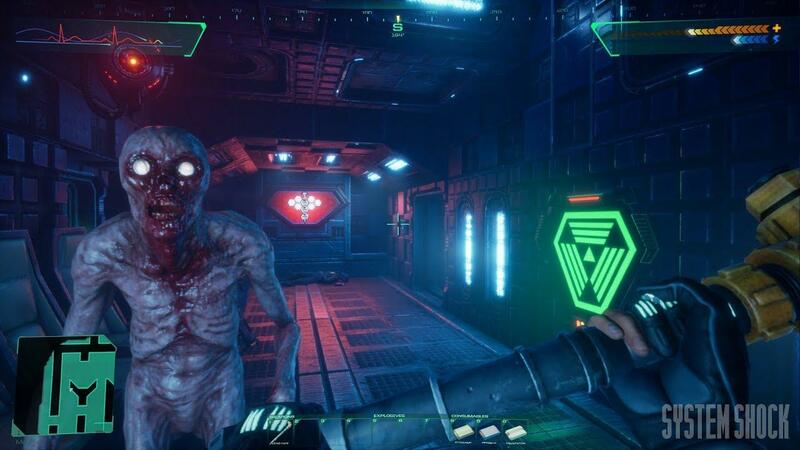 Am I the only one who didn't mind the direction of their System Shock design that they reversed? I'm not sure what people were complaining about. The one they reversed back to looks a bit more retro-styled, while the previous one that they now discarded, had a fresher look. Shmerl Am I the only one who didn't mind the direction of their System Shock design that they reversed? I'm not sure what people were complaining about. The one they reversed back to looks a bit more retro-styled, while the previous one that they now discarded, had a fresher look. So, despite the slightly less grandiose vision, I'm actually glad they're delivering on what they originally promised - SS1 with a modern aesthetic/mechanic. It's really hitting home in the nostalgia dept for me and I think that's what they were originally aiming for. Ugh, that pipe swing animation is awful. Nobody swings anything with intent to damage by holding their support hand that high.